The foam roller fits in the suitcase! A few days ago, Bonnie and I were discussing how nice it was that our world expanded when we married, joining each other's circle of friends, and then how it expanded even more when we started running a few years ago. Earlier this year, two long-time friends of Bonnie, Tara and Rick, moved to Boston. They both have strong connections to Boston, having gone to college at Boston College, and they have also run the Boston Marathon multiple times. In fact Tara was one of the people who first got me thinking about longer distances, challenging me to try a half-marathon a few years ago. 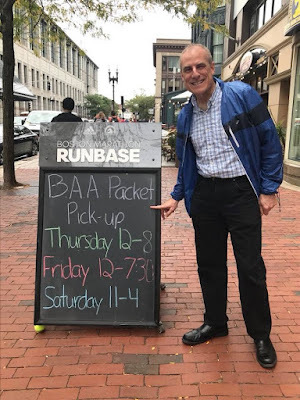 Earlier this summer, she suggested that I enter the lottery for the Boston Athletic Association (B.A.A.) Half Marathon. On July 12, shortly after 10 am when the lottery registration opened, I entered my name and credit card info. Within two or three days, I heard the good news that I had been accepted for the race! Rick's registration was also accepted in the lottery. 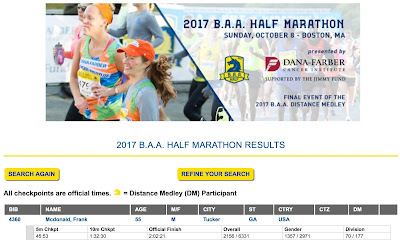 So we were Boston-bound, not for the famous 26.2 race in April, but for the final event in the B.A.A. Distance Medley, which included 5K and 10K races earlier in the season. Fortunately the half marathon coincides with a short fall break at Emory, so we wouldn't have to race back to Atlanta immediately upon completing the race. 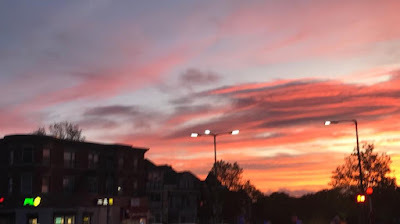 Our direct flight from Atlanta arrived at Logan airport on Friday afternoon, and we were welcomed at Tara and Rick's new home in the Back Bay neighborhood, near the Boston Common and an easy walk to downtown Boston. 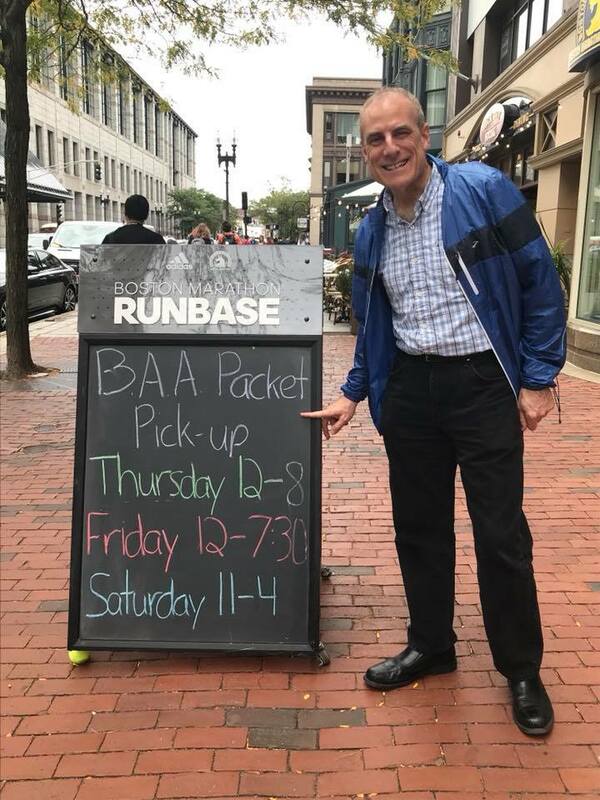 Rick suggested that we attend the runner's clinic at 6 pm at the Boston Marathon RunBase store, on Boylston Street, near the Boston Marathon finish line. I had received my bib in the mail several weeks earlier, and hadn't planned to go. But now I'm glad that we did, for several reasons. Although it's a running store with all of the usual gear (shoes, clothes, gels and other running nutrition, etc. ), it's also a small museum, describing the history of the B.A.A. and key events. Shortly before the presentation began, I was looking for a seat, and saw a gentleman wearing an Atlanta Thanksgiving Half Marathon jacket. I introduced myself, saying "It's nice to see another Atlantan running this race!" Our new friend Tommy and I were both excited to be running in Boston. Although the course promised some hills, as Atlantans we agreed that we're used to hills, and would manage well on the course. Before we had left the store, Bonnie had already connected with him on FaceBook (I did the next day), and it turns out that we know a few of the same people in the running community, although I don't think that we had previously met. the Boston Marathon, 50 years ago. Her autographed shoe is on display. At 6 pm sharp, the clinic began. One of the B.A.A. 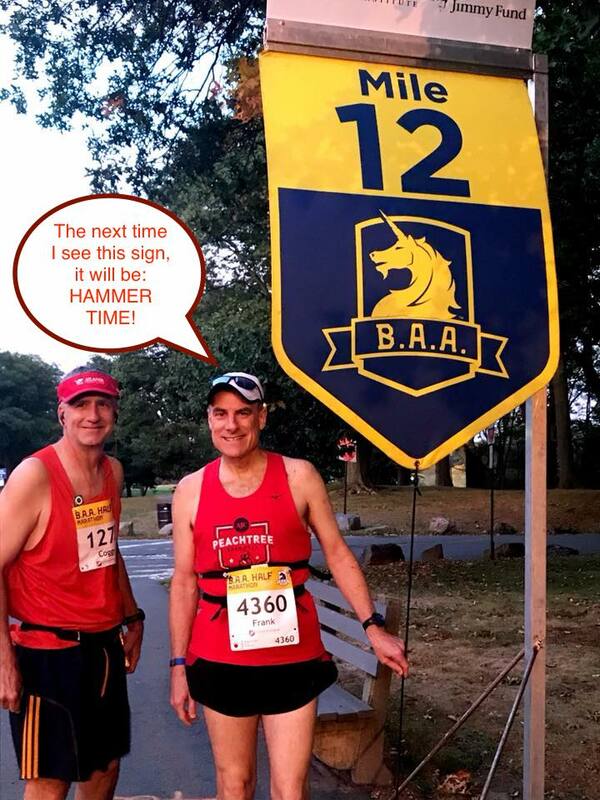 organizers assured us that they took Sunday's half marathon just as seriously as the more famous marathon, and promised to deliver a well-organized and enjoyable race experience. He also shared some general advice: whatever your training has been, well, "you're ready" - because you can't do anything more in the next 36 hours to prepare! I think that we all knew the rest of the advice given: don't try anything new on race day, don't eat a spicy or heavy dinner the night before, do go into the race with a positive but realistic attitude based on the conditions, and it was all presented with humor and encouragement. 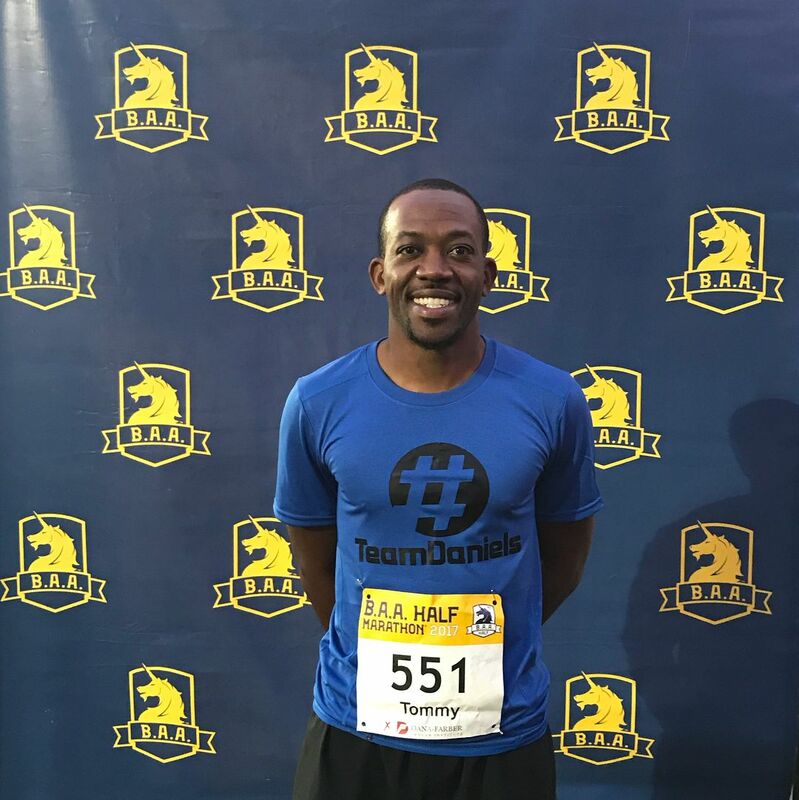 He discussed the half marathon course: mile 1 downhill, turnarounds at mile 4.5 and mile 10, mile 12 would be uphill, run past the zoo in mile 13, and finishing on the track. 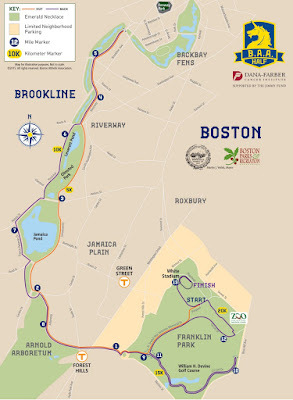 Water stations would be every two miles, with several medical stations also along the course if anyone needed assistance. He then introduced elite runners Katie Matthews and Dathan Ritzenhein. Katie had some good advice that I hadn't heard before, which I resolved to try out today: break the race into thirds (I've previously thought of the halves, the first six-seven miles and then the rest). She runs the first third at an easy pace (for her, I would never been able to keep up). The second third may be tougher, but her goal is to get into the last third in shape to finish strongly. Dathan mentioned that it would probably be difficult to "negative split" the course, given that the last miles were net uphill, but he recommended aiming to run with consistent effort. By the end of the clinic, I was fired up and ready to run the race! We met up with Tara and Rick immediately after the clinic, and enjoyed a nice seafood dinner Friday evening at Mooncusser restaurant - strange name but excellent food! On Saturday morning Rick and Tara took us to a local breakfast cafe, where I ordered shakshuka, a traditional Moroccan breakfast. I didn't expect the spicy cherry peppers - hopefully they wouldn't cause a problem 24 hours later! 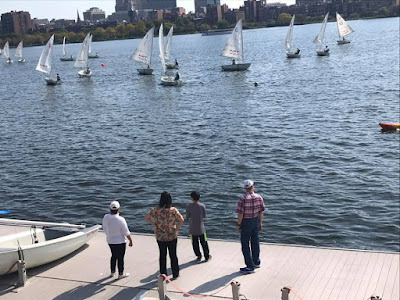 Then we walked across the Charles River to the MIT campus, where we met Bonnie's sister Sunny, who happened to be visiting friends in Boston on the same weekend. We had gone there to watch an alumni sailing regatta, but ended up "crashing" a couple of sessions of a conference on virtual reality, held in the MIT Media Center. Saturday evening, Tara and Rick took us for "carboloading" in the North End, a traditional hotbed of outstanding Italian cuisine. At Ristorante Fiore, I ordered a delicious lobster ravioli dish, which was satisfying but not heavy. Bonnie and I also shared a spinach salad, which was garnished with beets - so I selfishly took all of the beets for myself. I even had room to indulge in a chocolate chip cannoli across the street at Caffe Paradiso! It had been years since I had a cannoli, although it used to be a regular weekend dessert that I would pick up from an Italian restaurant, for the two years that I lived in New Haven, CT, ca. 25 years ago. At MIT. Am I thinking about my research competitor? We had returned to Tara and Rick's home shortly after 9 pm, and almost immediately turned in for the night. It might seem funny to be in bed before 10 pm on a Saturday night, but with a 5 am wakeup call, I was glad to get a full night of sleep. For some reason, my dreams were dominated by a running theme. Bonnie's alarm jolted us awake at 5:00 am, but plenty of time to eat my traditional pre-race breakfast of oatmeal with almond milk, a small bowl of blueberries for the anti-oxidants, and a banana to add a few more healthy calories. The weather forecast was unexpectedly warm for mid-October in Boston, 70 deg F at the start, plus a chance of rain after 9 am. I decided to wear a Peachtree Road Race singlet that I had brought, just in case it was warm. I resolved that I would need to run a little more conservatively than I had started in Atlanta last weekend, when it was 55 deg F at the start, so I would aim for a pace between 9:00 and 9:30 min / mile for the first few miles, with a run / walk interval of 3:30 / 0:30. We left Tara and Rick's home around 6:15 am. By the time we reached Franklin Park where the race would start and finish, the sun had risen. There were only some wispy clouds overhead, although it seemed that it might be cloudy in the distance, but I was glad to have brought sunglasses and a cap. The temperature was pleasant and there was a breeze keeping things nice, even a little too cool as I was not wearing sleeves, but I imagined that I would be plenty warm once we began running. I managed to jog for about a mile around the field, and got into the porta-potty line at just the right time: a line that was about 8 people long had multiplied to at least 50 people long when I had finished. During one last jog, I ran into Tommy who was doing his warmup as well. He introduced me to his wife, Stephanie, who was cheering him on today. The organizers encouraged us to begin lining up in the corrals after 7:30 am, even though the race didn't begin until 8:00 am. I lined up near the 9:00 min / mile pace sign, and was glad that I was there early, as the corral began to fill. Around 7:50 am, the National Anthem was played, and the crowd noise immediately fell silent. A man holding the US flag was standing just in front of me and to my left, and it was obvious that he was planning to run the entire race with the flag. It was special to hear the National Anthem in Boston, reflecting on the first battles of the American Revolution near Boston, 242 years ago. Then it was time for the race to begin: first the wheelchair racers at 8:00 am, followed a few minutes later by the airhorn sending off the elite runners. Our wave was held up for a moment, and then we began to move forward toward the starting line. In fact we were even jogging for the last 100 yards before crossing the timing mat. As we had planned, Bonnie was stationed on the right shortly after the start, simultaneously taking still photos and video as we passed. 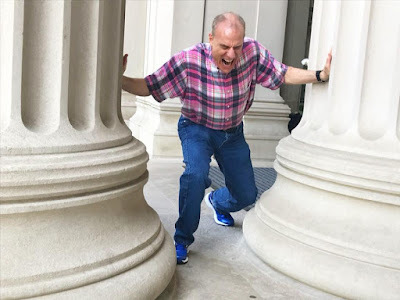 Although there were many runners around me (9000 runners were registered through the lottery, plus elites and fundraisers for the Dana Farber Cancer Center), everyone around me was moving at a reasonable pace. The first mile was indeed downhill, and I debated whether I should try to speed up to take advantage of the hill - and bank a little time, or just stick with my original plan of a 9 minute mile. 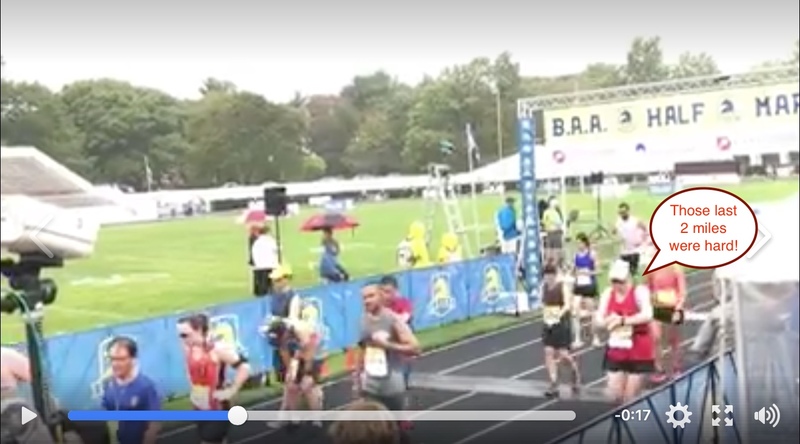 My better judgment won out, and I finished the first mile in 9:05. In fact my Garmin was sounding before I reached each mile marker, and the distance grew a bit more with each passing mile, but it was probably from weaving from the middle to the right side as each walk break approached. The run / walk strategy was working well for me. Almost no one else was taking walk breaks (the Galloway method is more popular in Atlanta, home of Jeff Galloway) so I was careful to signal each break with my hand in the air, and moving well to the right, even onto the grass or the sidewalk. But I would regain position quickly upon returning to the run. 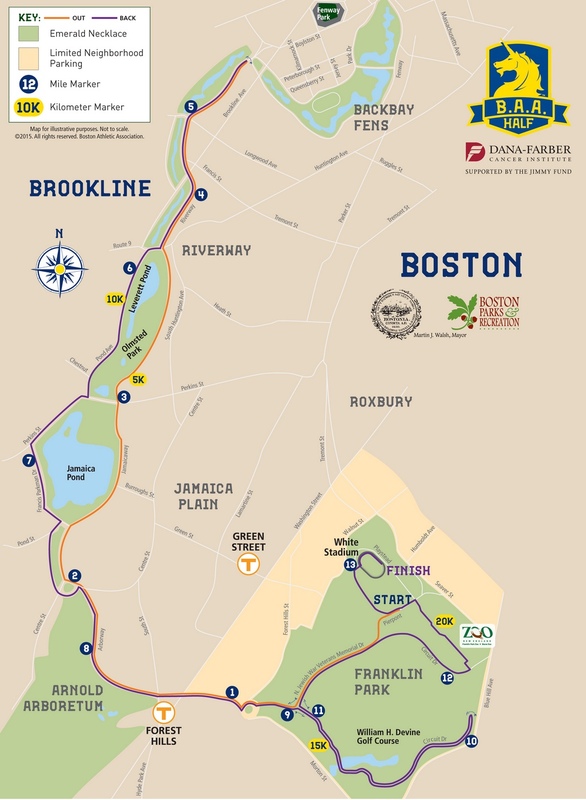 As we left the park, we were running along the picturesque "Emerald Necklace" designed over a century ago by the landscape architect Frederick Law Olmsted: most famous for Central Park in New York City, although he also designed Piedmont Park in Atlanta. Around 3 miles in, we entered a more urban area on the right side, facing the park. And shortly before seeing the mile 4 marker, we saw the faster runners on our left returning from the first out-and-back section. I was looking for Tommy and Rick, both considerably faster than me, and during a walk break I happened to spot Rick on the far side of the road heading the other direction. Rick's nickname growing up was "Coggy", a play on his middle name. As an adult he goes by Rick at work, but still uses Coggy as his nom de sport. I shouted loudly "Go COGGY!" and waved as he turned his head in my direction. It took a long time to get to the turnaround (about 4.7 miles in), but after turning it didn't take long at all to reach the 5 mile marker. By this stage, my watch was sounding mile alerts more than 20 seconds ahead of the actual marker, but I reached the mile 5 timing mat at 45:53, right on target for a 9:11 min / mile pace. I was feeling good, feeling strong, not tired at all. I kept up with the man carrying the flag for at least 5 miles, then pulled ahead and stayed in front for the rest of the race, although he wasn't too far behind on the out-and-back sections. Shortly before reaching the mile 6 marker, we split off to the right, passing by a small lake. I passed the 10K marker around 57 minutes elapsed, probably just about right for a 2-hour finish in a 21.1K race. In this part of the race, we encountered some uphill sections, but I powered up most of them quite strongly, except if I happened to be in a walk break. This was one of the nicest parts of the race in terms of park scenery. But I began to feel a little tired in miles 8 and 9. I was still running around a 9:10 min / mile pace, but I felt that I was about a minute (or more) behind where I had been in last week's race. The mile 9 marker was at the spot where we had left the park in the first mile, which I reached around 1:22. On my watch, I had finished nine miles at 1:21:23, but the mile 9 marker wasn't even in sight until well after the alert had sounded. Mile 10 was where the race began to get tough for me, the beginning of that last third of the race! This was the start of the second out-and-back, and I hoped to pick up a bit more speed here. But the route was hilly, more uphill than downhill. I took a walk break right before crossing the mile 10 timing mat, 1:32:30. 2-1/2 minutes slower than I had hoped, and I had run mile 10 in 9:30 according to the watch (and was probably a few seconds slower than that in reality). I hit the lap counter on my watch at that point, hoping that the watch would line up better with the subsequent miles. 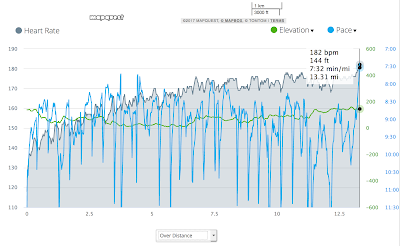 The turn-around was immediately after the timing mat, and so I was expecting more downhill than uphill on the return. Somehow that didn't seem to happen for me! Nonetheless I did manage to speed up a bit, passing a fair number of other runners, finishing mile 11 in 8:59 according to the Garmin. 1:42 elapsed, 2.1 miles to go. Surely I could run the rest of the race at an 8:30 min / mile pace, that would get me in around 2:00 even. But mile 12 was the toughest mile of the race, going uphill along much of the same path that we had run so easily downhill in the first mile. To make things more challenging, we were running directly into a headwind. And then, it began to rain! On the right shoulder, a runner was sitting on the side of the road, with a couple of medical personnel talking to her. I wondered what had happened, but kept pushing as best as I could up the hill. The rain ended after a few minutes. I was a little disappointed to finish mile 12 in 10:26, especially because I had known ahead of time that mile would be uphill. But that was the best that I could run that hill today. before picking up the pace again in the 13th mile, finishing strongly on the track. Mile 12: What time is it? HAMMER TIME, I said! 1:52 on the watch, 1.11 miles to go to the finish. I reminded myself, I have run a 7 minute mile, therefor I can still finish in 2 hours. But while the mind was willing, the legs were weak, after 12 miles elapsed. Although the route had leveled out, although I was pushing myself, the watch stubbornly insisted that I was only moving at a 9:15 min / mile pace. We were passing through the Franklin Park Zoo, and I saw a sign for giraffes - my favorite zoo animal, from a fond early childhood memory. The 20K sign appeared, 1.1K to go, about 0.7 miles. I accepted that 2 hours was now out of reach. But it seemed that more runners were now passing me even when I was running. Now my goal was 2:02, that seemed doable. I also remembered that my best time in the Publix Georgia Half Marathon was 2:02, and told myself that I was still running fairly well, I certainly had not "bonked." We turned onto the road where we had begun the race an hour and 57 minutes earlier. 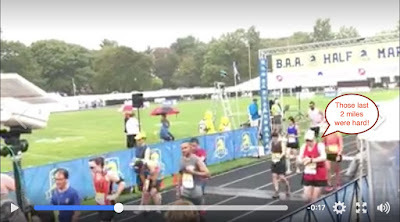 Was the finish line more than 3 minutes away? I saw a sign, "800 meters to the finish". That didn't seem far at all, until I remembered that 800 meters is almost 1/2 mile. OK, I've never run 1/2 mile in 3 minutes. Just keep pushing, pushing. That field was a lot longer than I had remembered, and it took a few minutes to get to the outside of the stadium. At that moment, a young woman crossed in front of me in tears, then seemed to fall into the arms of a red-jacketed medic on the left side of the road. I felt so badly for her, to be so close to the finish line and having to stop. I don't know what happened, perhaps a leg or foot injury? Dehydration? But I kept on running, finally seeing the entrance to the stadium, where the long-awaited mile 13 sign welcomed us! Entering the stadium, I could see the finish line to my right, which would be about 170 yards away, running clockwise. I settled into lane 2, was immediately passed on my right by a young woman in lane 1. Then a young man zipped by in lane 8! Showoff!! As I turned onto the straightaway, I saw a timing strip 100 feet before the finish line, and heard my name called after I crossed. I held up my hands to acknowledge the announcement, and put on a burst of speed into the finish, passing one runner who was moving fairly slowly. 2:02:21! Whew, that was a tough run - but half-marathon #17 done! After presenting us with our medals, and an opportunity to get a bottle of water and a banana, finishers were guided out of the stadium into the field where we had originally gathered. I took a few minutes to stretch using the fence for support, that helped a lot. There were two tents: the first offered donuts and bagels, and then the second offered hamburgers, can you believe it? I wasn't sure if I could eat a hamburger immediately after running 13.1 miles, but guess what? I was up to that challenge. Then I caught up with Rick, Tara, and Bonnie - they were amazed to see me holding half a burger! Rick ran an outstanding race, finishing in 1:45 and speeding up slightly as the miles ticked by, a negative split performance, even with the uphill sections in the final three miles! Post-race celebration was a lobster roll at James Hook's Lobster Shack near the seaport, and large coffees at the Intercontinental Hotel, where I was able to change into dry clothes for the ride to Tara and Rick's home. That was a lot of fun today. The race was well-organized and very well staffed with volunteers. I ran 11 excellent miles, one tough mile, and one satisfactory mile with a strong finish. Of those races on a certified course, I believe that today's run was my 4th fastest half marathon. I will have to check carefully, but it may be my best half-marathon in 70 degree temperatures. Overall pace, 9:19 min / mile.